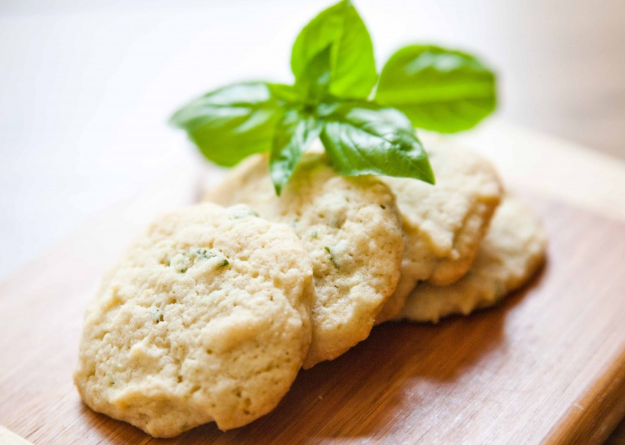 Lemon and basil are a great match in these chewy cookies. Another great example of how veggies can be used for sweet treats! Cream the butter until it changes color (pale), add the sugar and beat well. Meanwhile, sift the flour; add the baking soda and salt. Stir in the egg, lemon juice, vanilla, and lemon & lime zests. Beat until thoroughly mixed. Add the dry ingredients and mix. Fold in the basil. Measure tablespoonfuls of dough; place on a large baking sheet. Bake until edges are brown, about 10 minutes for a soft yet a bit crispy cookie. Transfer to a wire rack; let cool. Source: Slightly adapted from Chasing Delicious. Categories: Basil, Recipes | Tags: cookies, dessert, lemon-lime | Permalink. Our Recipe Blog turned 1! Enter your email address to follow our Recipe Blog and receive notifications of new posts by email.